John and Sandra are still here to welcome you to The Queens, a downsized version of the old Victorian Hotel, and now a super B&B where you will enjoy true hospitality. Whether a Tourist, Golfer, Cyclist or Walker, this is the place for you. Sandwiched between the Scottish hills and the Lake District Fells, in an Area of Outstanding Natural Beauty (AONB), we are situated on the coast with the most breath-taking views. A perfect place to relax and unwind, enjoy strolls along the promenade, soak up the atmosphere and the most magnificent sunsets across the Solway Firth. 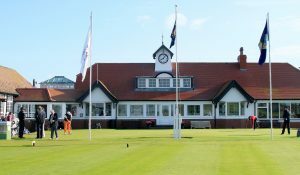 A long drive, a lucky bounce and a wedge will find you at Silloth’s Championship Golf Club. We are proud to say we have hosted many happy golfers and cyclists, over the years, here at The Queens. Being on The Hadrian’s Cycle Way we are a perfect first stop with secure cycle storage and good hearty breakfasts. Family rates are tailored to your family. Contact us for a personal quotation. Our rooms are recently refurbished, with spacious en-suites. 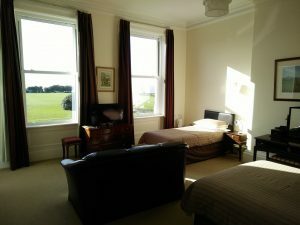 We have a good selection of rooms many with stunning views of the coast and beyond to Scotland. All rooms come with a bath and or shower, free WIFI and of course an excellent choice for your breakfast including the traditional English breakfast. 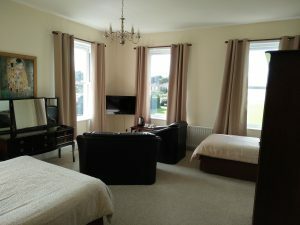 Rooms also have a TV and facilities to make your own hot drinks. 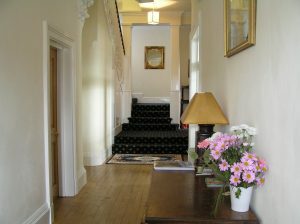 We also offer discounts for long stays. An ideal stop on Hadrian's Cycleway or a relaxing holiday exploring the Solway Coast and the surrounding countryside. Families are very welcome at our Bed and Breakfast. Directly opposite to our location you will find a very large green with entertainment area and the sea front where you can paddle and rock pool with the kids. With many scenic walks and a wide variety of birds to watch you're sure of an enjoyable stay. Contact us today to book now!